Some things are like a siren’s song. Classic cars. 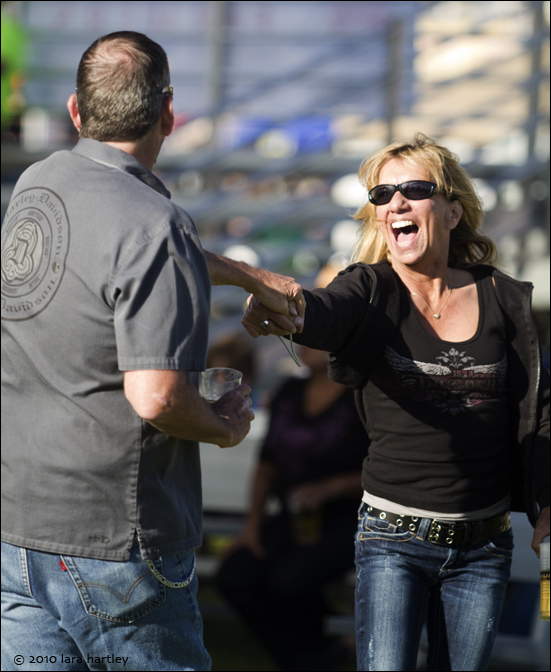 Harley motorcycles and rock concerts. Put them all together and I — AM — THERE! It had been a long time since I went to a real rock concert. 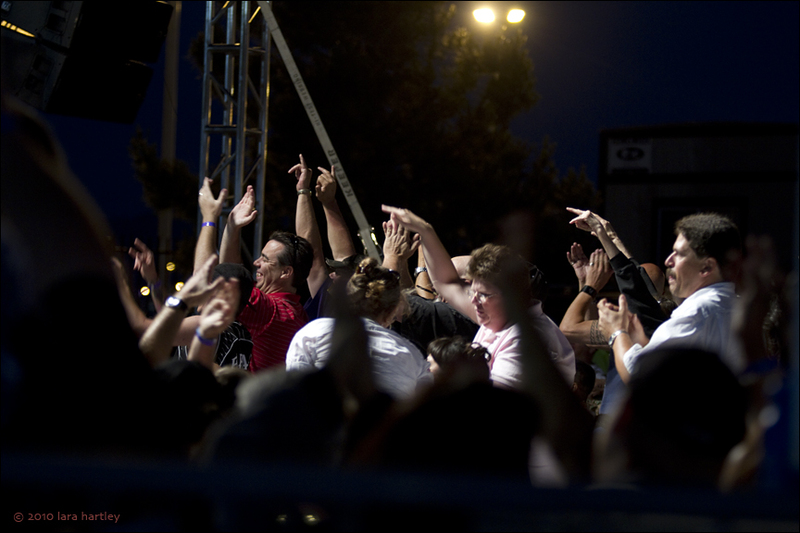 So when I heard “Starship featuring Mickey Thomas” was going to be at the Antelope Valley Fairgrounds as part of the Thunder on the Lot event, I just knew I had to go. 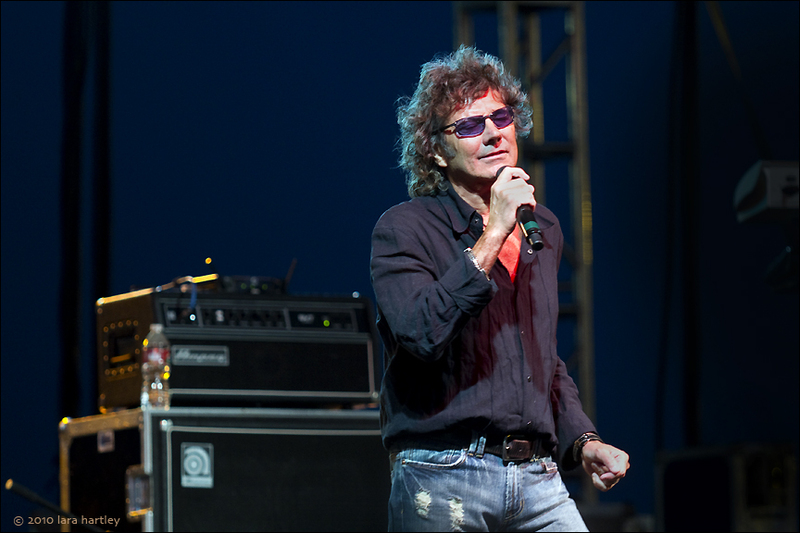 (above) Mickey Thomas croons his way through a ballad. I listened to some tunes on his web site and thought he would be worth the two-hour drive and the $10 gate. Plus $5 for parking but who is counting pennies when an adventure beckons. 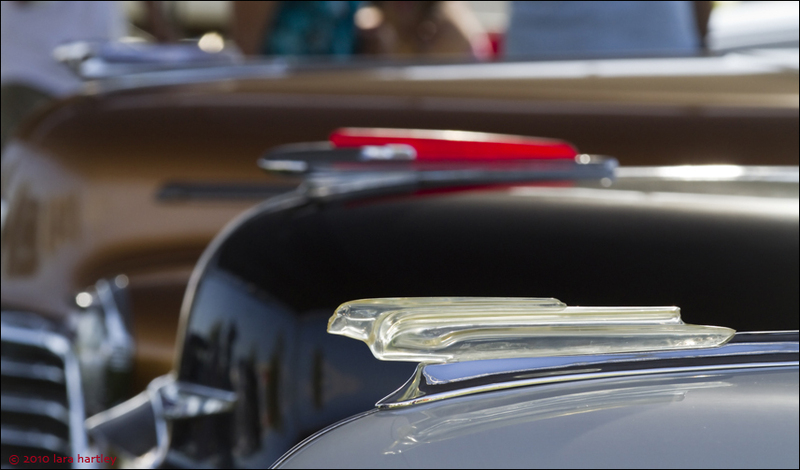 A bevy of Chevy beauties display their curves and distinct profiles. 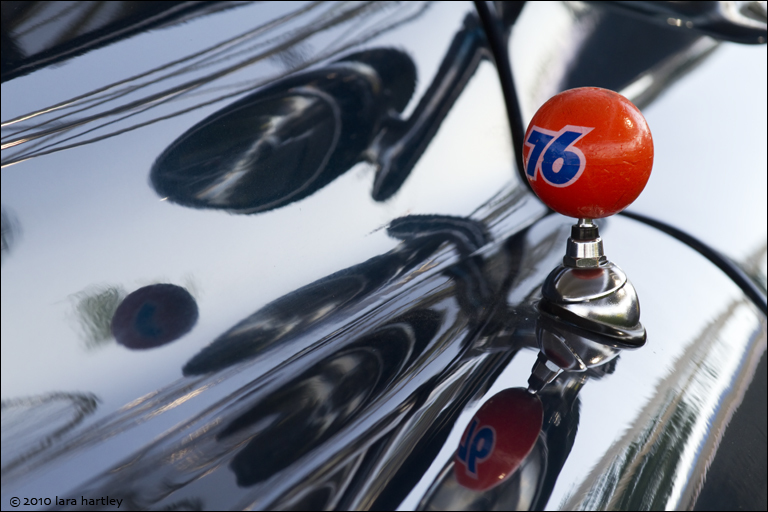 Angel Cardona’s ‘51 Chevy sports not only a cool hood ornament but also a Union Oil 76 antenna ball. And where there are classic cars, there are classic hood ornaments. I love hood ornaments. They are like miniature works of art. There were cherry custom restorations, celebrity appearances, tractor-trailers lit up like Christmas trees, local royalty, a carnival and lots and lots of music. 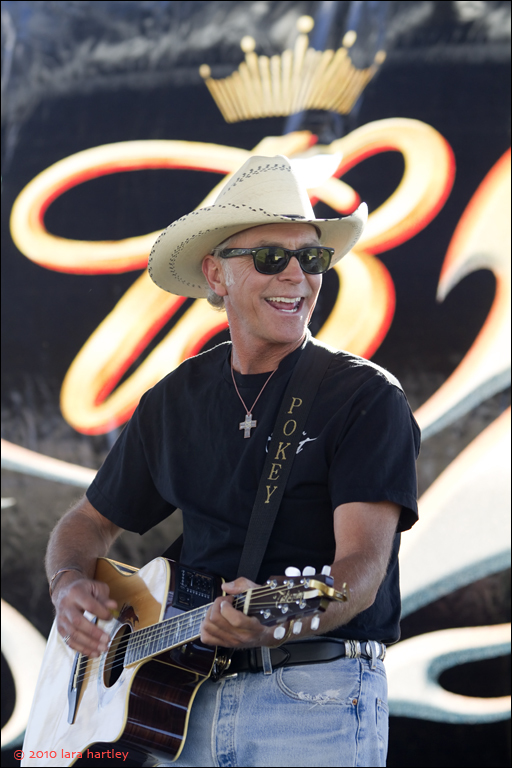 Blues, country, classic rock and heavy metal acts. A little bit of something for everybody. 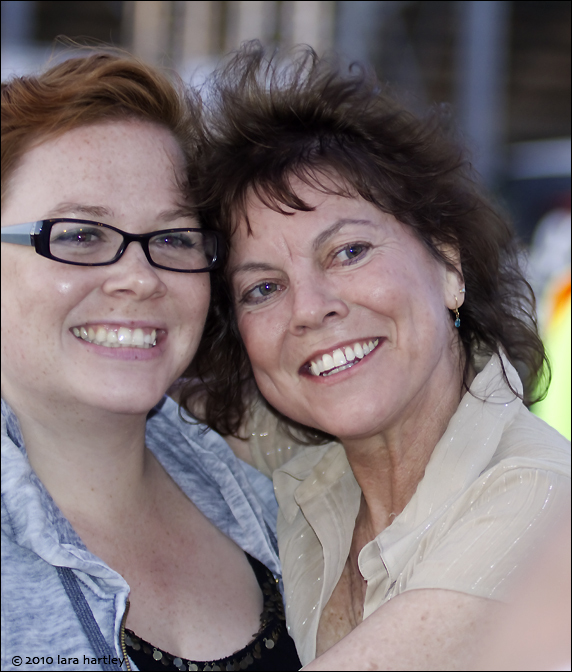 Fans were treated to the zany antics of celebrity guest star, Erin Moran who starred in the TV series, Happy Days. 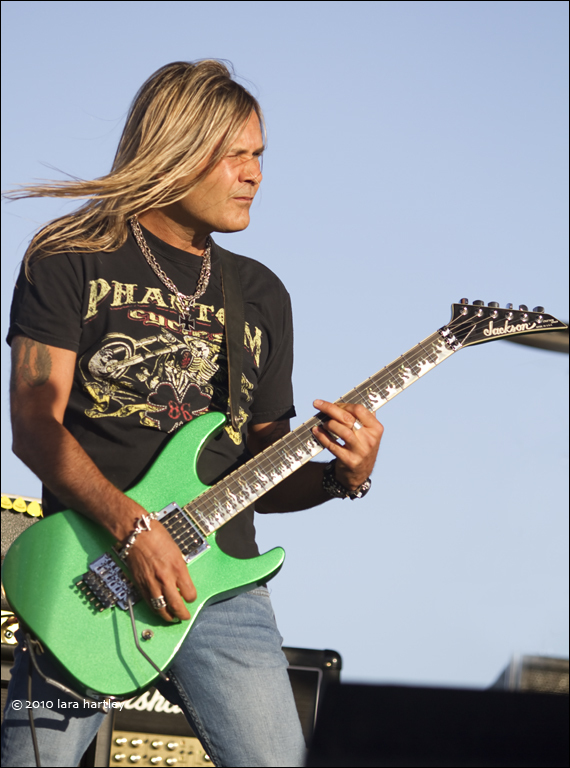 Runaway Train, with singer/guitarist John Spear, provides a little touch of country at Thunder on the Lot. Doug McLure and Marilyn Jones do a little boot-scootin’-boogie to the music of Runaway Train. Oh, and did I mention the drifting exhibition? Have you ever heard of “drifting”? Orange traffic cones are airborne after being struck by a little car doing drift maneuvers. Wow, that did look like fun, and what an adrenaline rush! You never knew when one of those puppies might come flying right over the barrier. But it was hard to capture in a photograph unless somebody hit one of the orange cones and sent it flying, or hit the fence, sending people running for their lives. The goal is NOT to hit the cones or the fence, but to maintain a controlled drift. Hence the name “drifting.” I wonder where the drivers practice that maneuver. Probably not on the streets where they live. 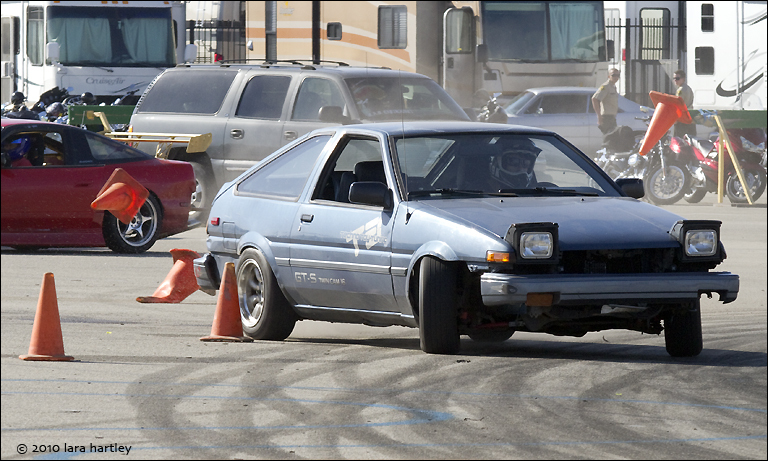 Wouldn’t you know it, after I left the track, one car drifted into the fence and I wasn’t there to get a picture. No one was hurt. 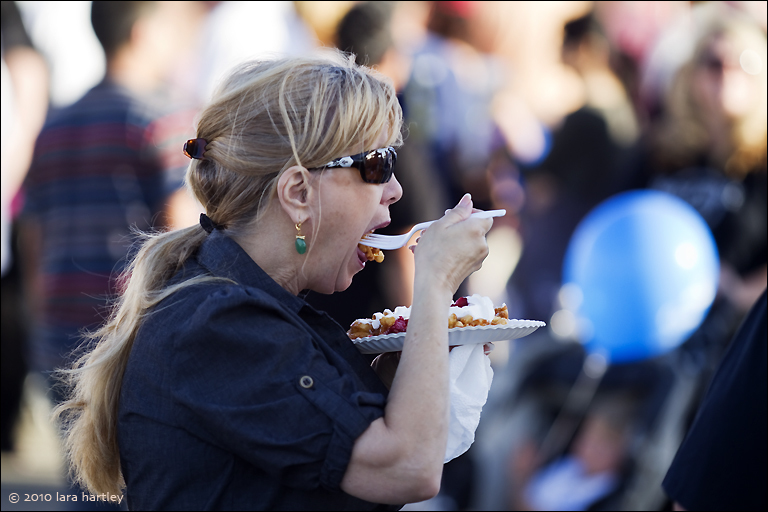 People were chowing down on funnel cakes, pastrami sandwiches, chicken wings and pizza. I had a fruit smoothie, or two. Those funnel cakes looked SO yummy but I was trying to be good and so resisted temptation. Funnel cakes with powdered sugar and strawberries are always a favorite. 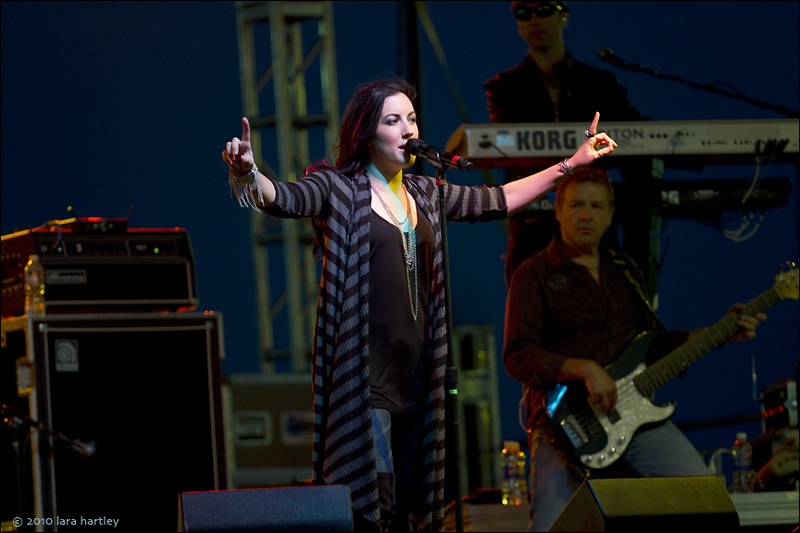 Wandering through the fairgrounds on the way to the carnival, I recognized the smooth voice of Gregg Rolie and Santana doing Black Magic Woman oozing out of a T-shirt booth. Very cool. 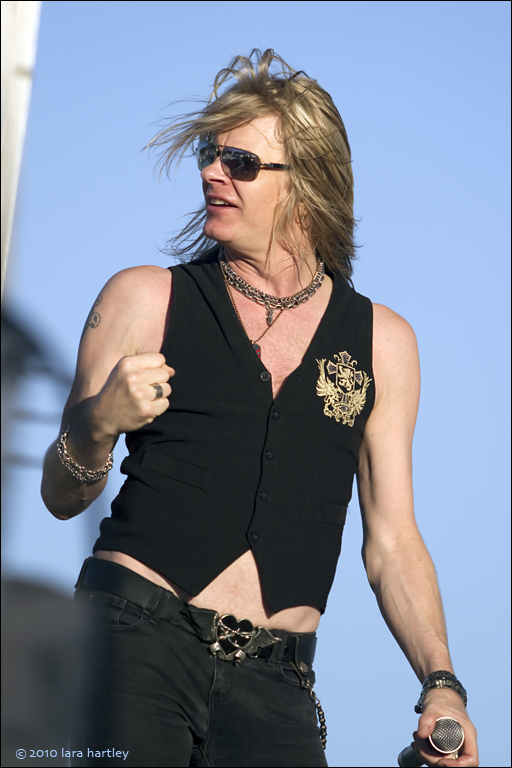 Hey, I could get a black spaghetti-strap tank top with bling on the front. Or not. A clown blew a frothy cloud of soap bubbles near a group of skateboarders showing off their skills in time to a hip-hop beat. Bubbles popped around them — a magical mixture of punk and fairy tale. While I was watching the skateboarders, an adorable little girl clutching a handful of ride tickets bumped into me. Her dad jokingly asked me if I wanted to go on a ride. The kid tried to stick a straw up her nose. I politely declined the offer. Hanging out at the carnival, watching the rides and talking with folks was fun but I wanted to see the really classy rigs in the exhibition hall. Cadillacs, Jaguars and a Rolls Royce or three were simply stunning. I couldn’t imagine anyone actually driving one of those knockouts on the road. And they certainly weren’t taking part in the drifting exhibition. To make sure I had a good seat for the headlining “Starship,” I decided to hang out and listen to the covers band. I thought it would be sort of a classic rock group, maybe some blues; not ear-bleeding, hard rockin’ Metal. But when lead singer Chas West came out I was sure we weren’t in blues-land. 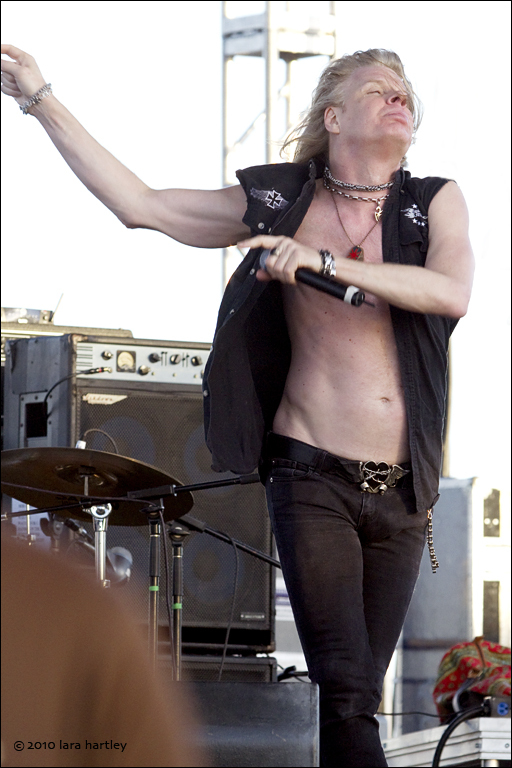 I think the skinny barely-hanging-on black jeans and vest with no shirt were the first clues. Heavy Metal: Loud makes it all — well, deafening. I did recognize a couple of songs though — “Come On, Feel the Noise” (boy they got that one right) and “Bang Your Head” (maybe tomorrow). To be fair, I am hardly an unbiased judge since Heavy Metal totally escapes me and I do not know who’s who. I asked the man next to me if he was enjoying the music. He looked at me as if I was nuts and said “Sure, it’s great!” It did seem as if Chas West was wailing and screaming in tune, and he had the young audience rockin’ in their boots. I didn’t know people made this kind of music anymore. It’s all noise to me. I distracted myself by photographing the band and people-watching. 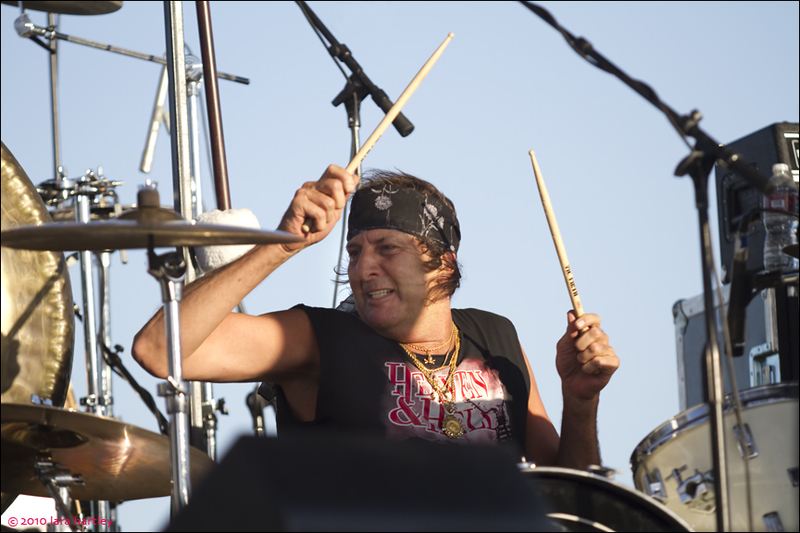 One of the great guys of the Hollywood rock scene, drummer Alan Krigger hasn't just seen it all, he's done it all — and he's back for more with the Hollywood Allstarz. He says drumming is in his blood and he has been doing it since he was a five-year old growing up in the Bronx. But my ears were ringing, my head pounding. How I could I hear the band I came to hear if I could not hear? I needn’t have worried, “Starship” had their own pounding sound system but at least it didn’t make my head explode. This woman was not just channeling her inner rock chick, she was a full-blown groupie lost in the music; her eyes adoringly, raptly intent on the band, oblivious to the world. She was swinging her long hennaed hair around and around like chicks did in those old MTV videos — her assets out there for the world to see. I wonder if she dresses like that all the time — tiny skirt, knee high boots and a tight sweater. Definitely an LA look. As VIPs filed into their seating section, one lady in a sensible beige blouse had her fingers in her ears and a tight-lipped grimace on her face. Her paunchy, Hawaiian-shirted husband grinned like a school boy. He was reliving his teenage rock ‘n’ roll years. She was not amused. I kept my inner rock chick firmly in check. Besides, looking around at the middle-aged groupies, I was decidedly out of place. My lips were not plump enough, my bottom too plump for size 0 jeans, the skin on my face not stretched to the snapping point and my bosom not ample enough to spill over my pink lace shirt. I had figured it was going to be too hot for my normal black garb so that morning I dug up something pink. I was the only person in pink I saw all day except for some toddlers, girl toddlers. The boy toddlers were in blue. Almost everyone else was in black or in animal prints accessorized out the whazoo. 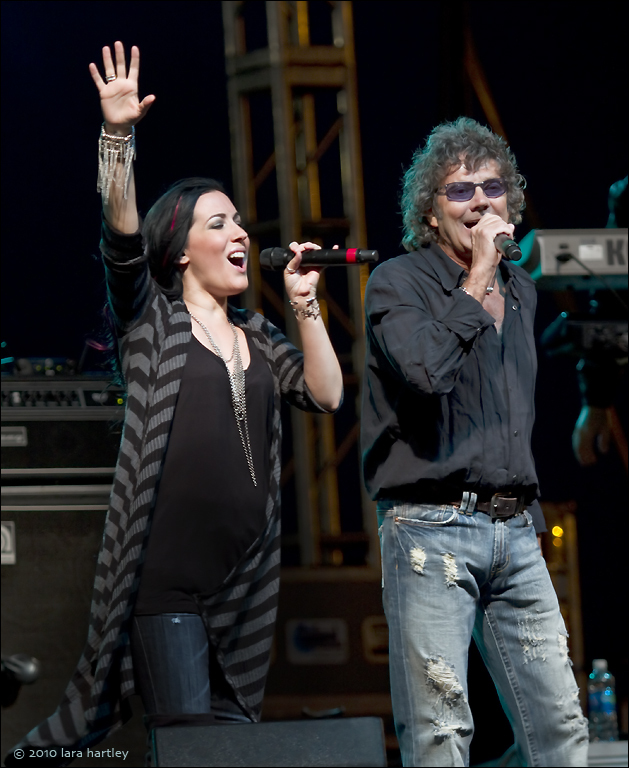 “Starship with Mickey Thomas” was not exactly what I had hoped for. Maybe it was the setting, or perhaps Thomas was not having a good night vocally. Friends had told me he was still sounding good for a 60-year-old rock star, but like I said, he was not in good form. I have to admit though, the band sounded better the further one got away from the stage, less distorted. Folks were dancing in the aisles as the band cranked its way through “Jefferson Airplane” and “Starship” classics. This is what they had come to hear. A blast from the past. Despite the pizza, it was still a great day — even with the heavy metal. And I have to admit, I rather liked the barely-hanging-on skinny black jeans. What a great time this would be. You made me feel like I had been there. Thanks for the refreshing “trip” down retro lane…now where did I put those bell bottoms,paisley shirt and buckle boots I loved so much!!! Fun story and great photos as always!